Let’s start the week with some upbeat “feel good” music courtesy of Family of the Year. 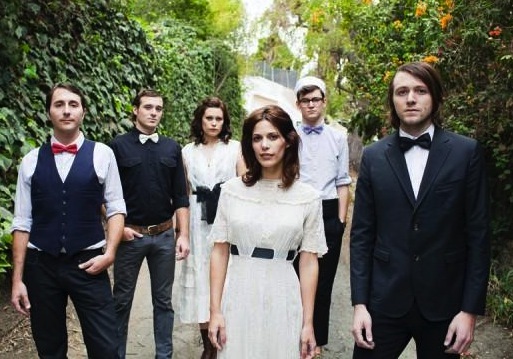 This Californian 6 piece indie folk band is all about soft guitar chords, bright vocal harmonies and toe-tapping beats and their sun-soaked songs are like so many memories of the long forgotten days of summer. The sextet mix together Fleetwood Mac-style guitars, Beatles-inspired melodies and some Beach Boys influences and they manage to come up with their own personal folk(ish) sound with hints of Americana and country. On their latest EP, Through The Trees, which includes the track “Chugjug”, Family of The Year braid catchy melodies, stellar male/female vocals and personal folk tales to create some of the happiest and saddest music you’ve ever heard. For your listening pleasure, “Psyche Or Like Scope” is a personal favourite, taken off Family Of The Year’s sumptuous debut album Songbook. You can buy it on their Web site on a “name your own price” basis, which means you can donate however much you want. Give whatever you can afford but do give the band this little push they truly deserve.